My Living DNA results have proved a bit of a curate’s egg. Good in parts, but leaving me with major question marks in others. I’m 100 per cent from Great Britain and Ireland, which correlates with my research so far. I’m also predominantly of Yorkshire ancestry; more precisely South Yorkshire which, as defined by Living DNA, roughly comprises the South and West Yorkshire counties. Park that piece of information. Given what I know, my next largest component is unsurprisingly Ireland at 9.2 per cent. My research so far shows this is all County Mayo, so my 4th ethnicity component of 6.2 per cent southwest Scotland and Northern Ireland is not a shocker either, with its proximity to Mayo. But that’s where it ends. 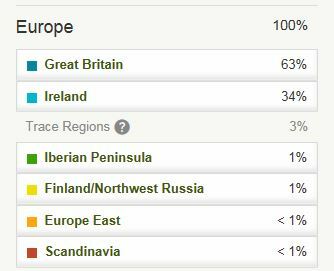 My family history research does not match my LivingDNA results in some fairly significant areas. My ancestral origins research doesn’t go back the estimated 10 generations the LivingDNA results capture. But my research shows North East England ancestry, from the Durham and Northumberland areas: one set of 4x great grandparents were born in those counties (Ann Jackson in Northumberland and Robert Burnett in Durham). The evidence is backed up in several record sources, most crucially a documented, bitter, removal order dispute. 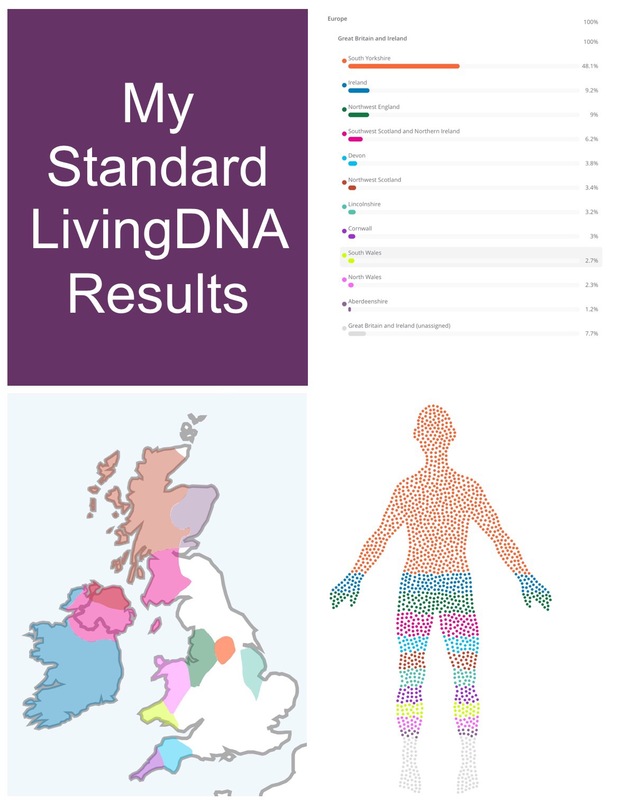 Yet my LivingDNA standard result, the one which links to the test’s best-guess reference population ancestry sources, does not show any ancestry in their designated Northumbria area. This roughly equates to the Northumberland/Tyne and Wear/Durham/Scottish Borders/Fife areas. 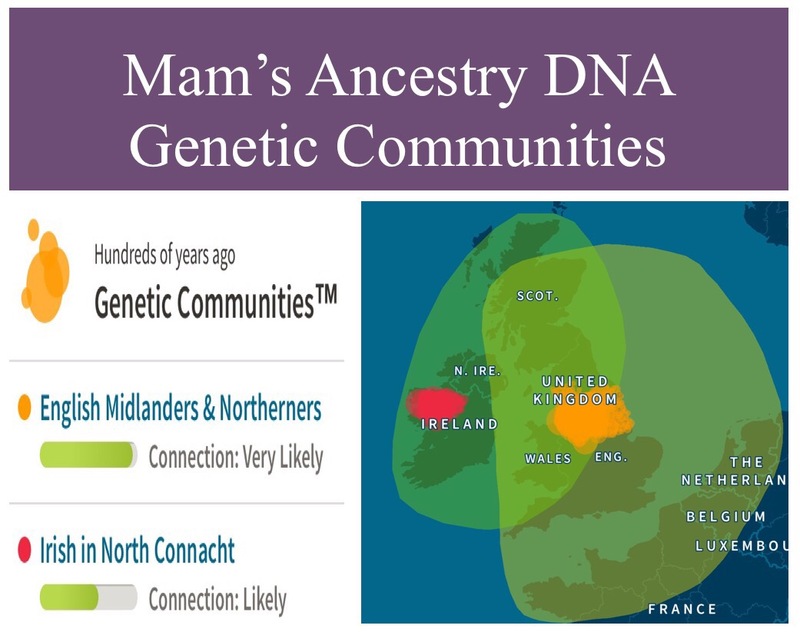 Neither does Northumbria feature in my complete result, the one where the test attempts to allocate the unassigned 7.7 per cent of my genetic make-up to regions where it look most similar. Perhaps Ann and Robert’s parents (my 5x great grandparents, John Jackson/Elizabeth Hayes and Stephen Burnett & his one-handed gypsy mistress Charlotte) all migrated and settled in that area from elsewhere – possibly Scotland. Despite me not yet having any ancestors from north of the border, my standard result has identified percentages from three of the Scottish areas (albeit one of those is the aforementioned Scotland/Northern Ireland region). The other conundrum is the absence of any North Yorkshire trace in the standard test, basically the North and East Ridings. The explanation may simply lie in proximity to county boundaries and 1974 boundary changes. I have relatively recent (if you call 18th century recent) ancestry around the Sherburn-in-Elmet, Saxton-in-Elmet, Brayton and Hemingbrough areas. These all fall within what is now North Yorkshire. However, prior to 1974 the first three were in the West Riding. Hemingbrough was in the East Riding, but it is only five miles, as the crow flies, to Brayton. So they could conceivably fall within the LivingDNA South Yorkshire zone. 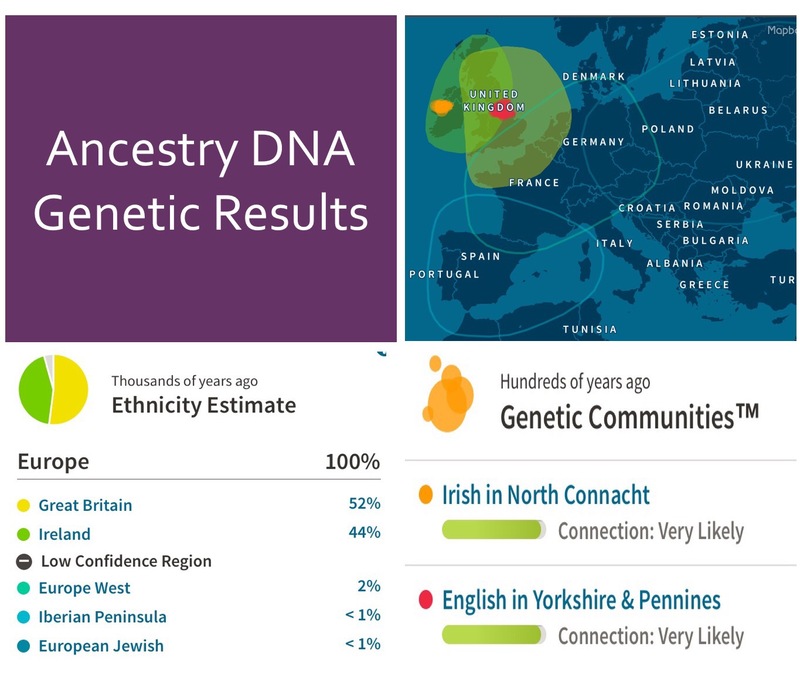 My complete results do pick up a trace 1.2 per cent North Yorkshire ancestry. Other surprises? Well the shock for this white rose Yorkshire lass is she has genetic components from the dark side of the Pennines, possibly (whisper it) the red rose county. Though, in the absence so far of any North West roots, I’m claiming that any such ancestors must be from the Cheshire/Merseyside/Staffordshire and not Lancashire parts. We’ll see what further family history research down the line turns up. I also have Welsh DNA – 5 per cent in total from North and South Wales. And then there’s the 3.8 per cent Devon and 3 per cent Cornwall. So THAT’s why I’m addicted to Poldark! And I’ve a remarkable absence of southern-ness. English in Yorkshire and Pennines (very likely) which again fits with my research. The confusion here is the Genetic Communities of my parents are slightly at odds with me, as shown below. And mum, given her dad is from County Mayo, may be disappointed with her “likely” Irish North Connacht outcome. At a simplistic level, it’s easy to ask should not all the results be the same? After all, there’s only one genetic me (hurray!) But delving deeper, the difference is not unexpected. The companies have different reference groups, time measures and, possibly, a different emphasis on the ethnicity element of their tests as opposed to the DNA matching side. 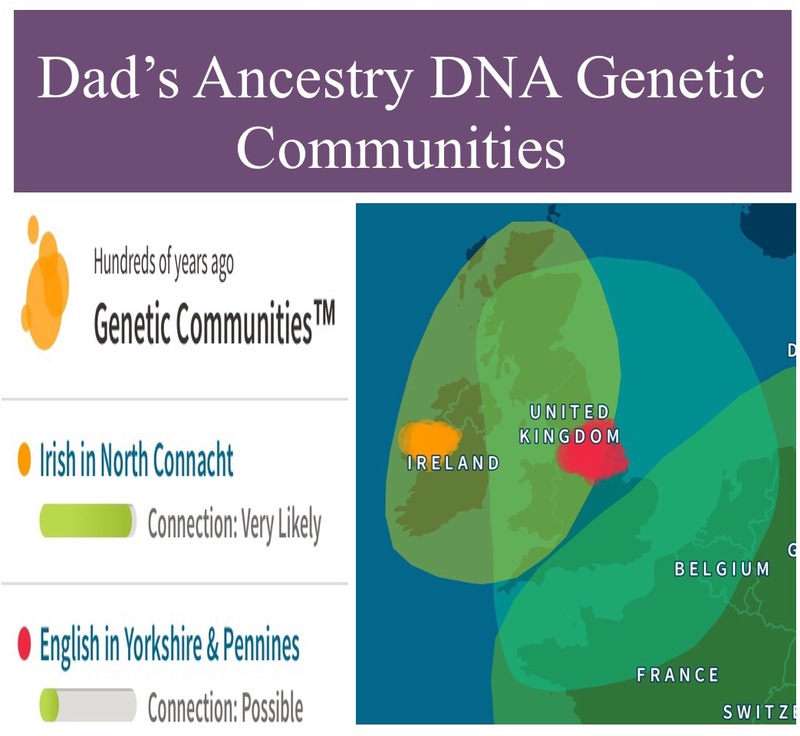 LivingDNA is much more of a deep dive into 21 British/Irish genetic groupings (80 worldwide ones), rather than the broad-brush overview given by Family Tree DNA and, to a lesser extent, Ancestry’s nine UK/Ireland regions. Finally, for those DNA experts, my LivingDNA Mitochondrial DNA (mtDNA) has me in Haplogroup U4, Subclade: U4b1b1. U4 is found in low frequencies across much of Europe and Asia, more commonly in populations near the Ural Mountains and Volga River in Siberia. According to LivingDNA U4 is “an old group, which helps to explain the relatively low frequencies in populations today. It is now thought that haplogroup U4 was involved in migrations into Europe from the Middle East that occurred before the end of the last ice age”. So, to sum up, my test leaves me with much more work to do to build my tree to try to prove these new elements to my ethnic make-up. But it also gives me some new migration theories to work with. 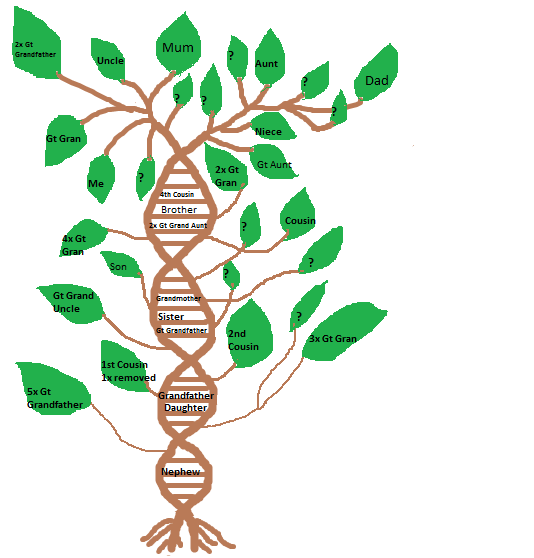 This is the third in my series of posts about my genetic genealogy journey. I ended my last post at the waiting game phase, all kits on their way. Things have progressed and I thought it helpful to provide an update. There is a lengthy delay in the anticipated result date of the FTDNA Y-DNA test. Hopefully this is a good sign, due to its popularity and hence the number of testers. But the thing I found must perplexing was the difference in timescales for mum and dad’s Ancestry tests. These were both posted the same day from England to Dublin. The results for mum’s test came through significantly ahead of schedule, in fact even before dad’s vial of spit got there. I really did suspect his was lost in the post but, when I asked, Ancestry said it allows 20 working days before a test is designated such. 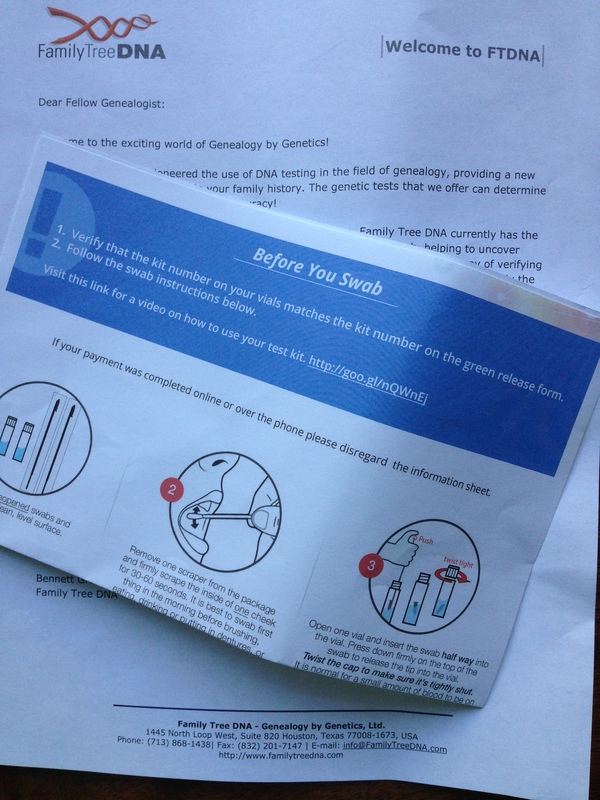 More amazingly the FTDNA tests posted a couple of days after dad’s Ancestry one, and destined for Texas, arrived before his Ancestry test. But dad’s test did finally reach its destination. So the moral of the story, which seems to be the DNA theme, is do not give up hope and do not assume tests posted on the same day will arrive at roughly the same time! And one final thing to watch out for, there can be a delay between the test actions being annotated on the site and the email notification reaching you. Mum’s Ancestry results came in on 13 July, a mere 17 days after posting. I have now had a quick preliminary look at them and these are my initial findings. First thing to say is the site is easy to navigate and a pleasing mix of charts, tables and expandable “?” Boxes. It is all very intuitive and clear. In terms of ethnicity there are no surprises. My mum has an English mother and Irish father. Her ethnicity results show 63% Great Britain, 34% Ireland. Of the four trace regions, Ancestry state “it is possible that these regions appear by chance and are not actually part of your genetic ethnicity”. So on this basis I am not claiming any tentative Armada, possibly false in any case, ancestry. The results correspond with all my research to date (going back to the early 17th century on mum’s maternal line). It is good to have general confirmation of my research. But this is more an interesting coffee-table talking point rather than anything more substantive. Then onto the meaty stuff – the DNA matches. The upfront view is mum has 44 4th cousins or closer and one shared ancestor hint. The latter is like the Ancestry tree shaky leaves. I excitedly went to the “View all DNA matches” button and immediately felt overwhelmed, but thrilled, to see 57 pages of them, with around 50 entries per page. These are split into relationship ranges and confidence levels. The 4th cousin box refers to possible 4th – 6th cousins range and this is the first batch of matches listed in mum’s case, as this is the closest identified relationship. Mum naturally has a significantly larger distant cousin category, with a possible range of 5th– 8th cousins. This is the remaining 56 and a bit pages. Ancestry assign the following “confidence” ratings to the matches: “Extremely High”, “Very High”, “High”, “Good” and “Moderate”. At this point it may be worth mentioning that ISOGG has a useful piece explaining the Ancestry confidence scores and their realism. It may be that the percentages for sharing a common ancestor are set too high. There is also the caveat that the “AncestryDNA database is 99% American, and it is not yet known if these ranges will apply in the same way to other populations”. Enthused I spent an afternoon ploughing through the first page of matches, only to become increasingly frustrated. This page included all 44 4th cousin matches. Six of these had “extremely high” confidence markings and the remainder “very high”. There were also two “very high” and four “high” distant cousins on this page. Clicking onto the individual matches brings you to the next level. There is a “Pedigree and Surnames” tab which identifies all the surnames associated with the match’s tree. Helpfully shared surnames are pinpointed at the start, so this cuts out trawling through a whole list of surnames to pick out the ones in common. There is also the tree section on the right hand side of the page. 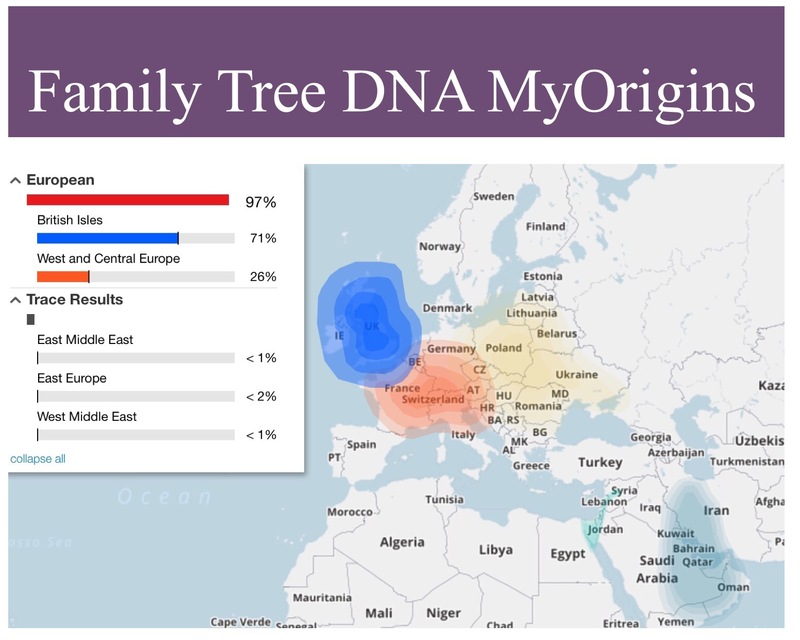 A second tab entitled “maps and locations” has a summary column as well as a map with coloured indicators identifying your family tree locations (blue) and those of the DNA match (mustard). Any shared locations are immediately recognisable, as the pointer for these is green. A word of caution though – the maps are not entirely accurate. I uploaded my tree via a Family Historian GEDCOM file. The Ancestry programme has some fundamental discrepancies because my descriptors do not accord exactly with the Ancestry format. For example some of my Yorkshire ancestors are placed in the Isle of Man, Kent and the North East. I have corrected this. Of less importance, but useful to know, is that if a vague location descriptor is attached, such as England or Ireland, the pointer will appear in the middle of the country. Or some may have assigned a county level rather than place-specific location. For example I have seen several matches with County Mayo as a location, (including a couple on my tree), but no further detail as to where in Mayo. So do not take the pointers at face value. Worth using is the “Note” box. I am entering brief details about the DNA match’s tree and any obvious connections. It is also helping me keep track of the reviewed matches. However my initial enthusiasm soon evaporated as it began to feel more like an exercise in futility. Of the 44 4th cousin matches six have private trees, although some of these do have public trees elsewhere on Ancestry; 11 have no tree; and five have less than ten people in their tree. Possibly some of these are individuals trying to find their DNA roots. Though this means straightaway a significant proportion are rendered relatively meaningless for my DNA purposes, at least for the immediate future. When I first embarked on this journey I did wonder about linking my hitherto private tree to the test. I have for several years steered clear of putting my tree in the public domain, for privacy/copying reasons, having had my fingers burned years ago when I had a public Genes Reunited tree. It was a horrid experience and that copied information is still out there on a website. It is not something I ever wish to repeat. So I get perfectly why some trees are private. Others may, for personal family sensitivities, decide against a public tree. It is after all an individual decision. However in the end I decided to do a reduced, skeleton-form tree specifically for DNA test purposes. My reasoning for doing this is having a private tree might cause people to by-pass me; it might be of assistance to other potential matches and facilitate contact in the interest of a shared goal; it could eliminate protracted fishing-questions; and it hopefully will minimise the risk of wholesale copying, my big fear. Anyway, back to the DNA results. Of the remainder of mum’s matches with trees of more than ten individuals, a couple are of peripheral interest and I may in due course make contact. At least though there is something concrete to base any contact with the tree-owners on. For the other matches on this first page there is no obvious connection. I will go through the remaining 56 pages of matches over the coming months. But I will prioritise my search focusing first on those with larger, accessible trees. I will also make more judicious use of the location/surname search filters as this will indicate common data even in private trees, although in the latter cases just at the top level. And hopefully, as I become more familiar with what the site has to offer, my frustration will decrease. And I have not entirely given up hope. My mum’s shared ancestor hint is a distant cousin match with a “good” confidence rating. This appears on page four of the matches. There is a tree attached. And, from this, the match is at 6th cousin level. It does not break down any brick walls for me, but it is a start. So, in summary, I am finding that genetic genealogy is no silver bullet to break through brick walls. It is more of a long game and another tool in the genealogy box. Hopefully DNA match success rates for me will improve as more and more people, especially from England and Ireland, sign up. I am even considering doing the test myself. But the bottom line is you are still reliant on people linking a meaningful tree to their DNA test; or those with private trees responding to messages; and those trees being accurate. Last month I wrote about my decision to embark on a genetic genealogy journey. 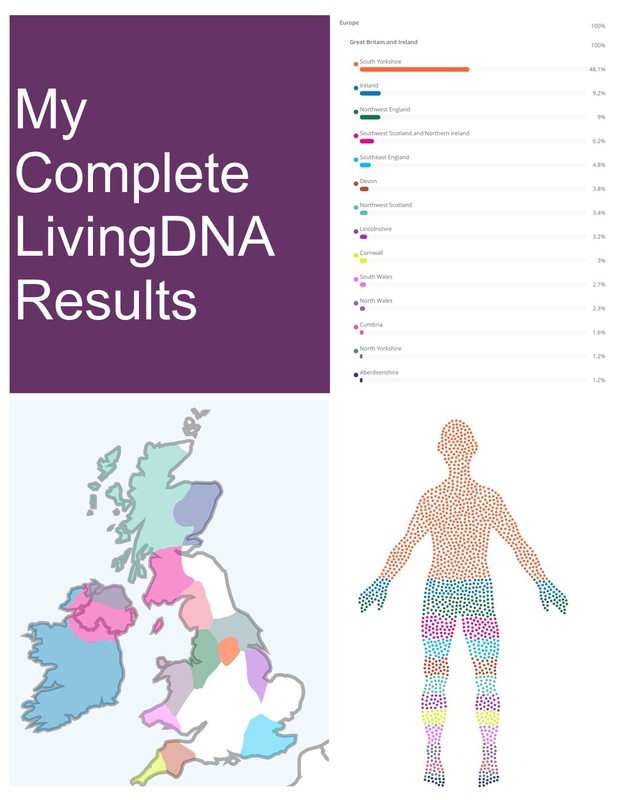 This included a FamilyTreeDNA (FTDNA) Y-DNA 37 and mitochondrial “Full Sequence” test for dad; a FTDNA Family Finder autosomal test for me; and an autosomal test for both mum and dad with Ancestry.co.uk. The test kits from both companies arrived speedily. The Ancestry kits ordered on 19 June arrived on 23 June; the FTDNA kits ordered on 17 June arrived on 26 June. I decided it would be too much to inflict both tests on the same day for my dad. So the Ancestry tests were undertaken on the evening of 26 June, as dad was home from the nursing home for the weekend. Timing was key. You are advised not to eat, drink, smoke or chew gum for 30 minutes before taking this test. So I had to work round dad’s tablet regime. The test itself involved spitting into a small tube. Although the kit explains it amounts to less than ¼ teaspoon, I was a little concerned it may prove problematic as my parents are elderly and dad is not in the best of health. I also think they were both a little daunted initially because the tube looks to be deeper than it actually is. In reality dad had no difficulty. And, although mum took longer, I suspect this owed something to the fact she had just emerged from a hot bath. Tests completed and activated online, they were posted (return postage included) on 27 June and I now await the results. The processing time according to the Ancestry.co.uk website is 6-8 weeks. I’m now at the obsessive site stalking stage, tracking the progress of the little vials of spit. Mum’s arrived on 3 July 2015, although I was temporarily thrown by the American date format of 07/03/2015! Dad’s is still somewhere in the post. I have also linked the tests to my Ancestry Family Tree. This is proving to be the most time-consuming activity, because I realised that my Ancestry (private) tree is so old; and I have a backlog of data to input into my Family Historian package so it is not simply a case of uploading a GEDCOM file. I also wonder if it is worth linking the tests to my full family tree or whether I should just create a specific direct (public) ancestor tree for the purposes of the DNA tests. 28 June was the date set for the swab element of “Operation Spit and Swab”. The advice it it is best to conduct this test first thing in the morning before brushing teeth, eating, drinking or putting in dentures, (fortunately the latter was not a consideration for either of us). It meant getting to my parent’s house as soon as dad woke up on Sunday morning, an early start on a non-work day for me. The test involves two 30-60 second swab scrapings, one for swab for each cheek. These swabs are then inserted into separate vials. Dad, who has undergone the Ancestry and FTDNA tests, said they were equally simple to do. The most difficult element for me was planning the optimum time. Both dad and my swab kits were posted on 29 June. Postage is not included from England with FTDNA, so this cost £3.50 per kit. Projected timescales for the autosomal test is similar to Ancestry.co.uk. However a FTNDA website update indicates that, as of 24 June, turnaround times for mtDNA tests are subject to delay (now anticipated to be 7 to 9 weeks); the Y-DNA tests have a slightly longer delay (11 to 13 weeks). So it pays to keep checking the website for any changes. Once again I found setting up surnames and most distant ancestor details on the FTDNA website to be more labour-intensive than the tests. Now it’s a case of an anxious waiting game. I will provide a further update once the results start arriving. But this could be quite some time away. I have finally succumbed to the lure of genetic genealogy. DNA testing was heavily pushed at Birmingham’s “Who Do You Think You Are? Live” earlier this year. Up until that point it was not an issue I had really given a second thought to and I did resist the hard sell on the day. To be perfectly honest I viewed it as an “Emperor’s new clothes” type of subject and to a certain extent I still remain very sceptical about what it can offer for my tree. Also I am more of a humanities than pure science bent so, although there is some cross-over, I found the science behind the whole DNA package a bit overwhelming. Therefore if you are interested in that side of it you will be disappointed in my genetic genealogy adventure. This will be more about my personal genealogical DNA journey of discovery and what, if anything, it will add to my traditional family history research. The Birmingham experience did sow the seed of interest in the field so I guess the hard sell worked to a slower, less impulsive time-frame. Since my return I have tried to broaden my education around the subject. I wanted to find out as much as possible before deciding whether or not to take the big leap, not to mention part with my hard-earned cash. That is just my personality – cautious, wanting to weigh up all the options before I commit, undertaking a risk/benefit analysis type of approach. As a first step I looked at the “International Society of Genetic Genealogy” Website and Wiki page. I read a number of informative blogs. Kerry Farmer’s book “DNA for Genealogists” gives a brief but information-packed overview of the subject, including details about the major providers. Finally I looked at the websites of the various suppliers. My uncle died last summer, the man who got me into family history in the first place. I realised as I read the various books and blogs on the subject that with him went my last obvious chance to undertake a Y-chromosome test for my maternal grandfather’s line. This is one of my Irish lines, ironically the one I have had the most trouble with. There was also the dawning recognition over the past few months that my parents will not be around for ever. I may not have many more months and years to mull over a decision. A few years down the line I do not want the regret of not doing it when I had the chance. So for me the decision about going for testing is not around what I want to get out of it in the short-term, its more about seizing the opportunity whilst I still have it. Wrapped up in this is an element of lodging DNA for future reference, so it is there as tests develop. Once the decision to go for it crystallised in my mind, I had to choose which testing company to go with. Size of database was a major factor, and within that the interest of those undertaking tests for the genealogy angle. I am not particularly bothered about any health screening element so that swayed me against going with a company offering those services – maybe I am wrong but I had the perception that those undertaking such tests may be less interested in the genealogy element. Linked to database size I also considered potential future growth and geographical areas covered. Type of test offered played a part. Finally I also have an inherent curiosity and wanted to see what each of the tests offered in terms of results. Decision made and time to approach by parents. Dad’s initial response was to ask why I wanted to waste my money. However he agreed to it. Initially I intended ordering only a Y-DNA 37 test for him. But after consideration I also decided to go for a mitochondrial “Full Sequence” test. Not wanting to be left out I have gone for the Family Finder autosomal test for me. I placed my order with Family Tree DNA on 17 June and am now eagerly awaiting the arrival of said kits. Mum was interested too. So on 19 June I ordered an autosomal DNA test for her. However I decided to go with a different company, to see how the experience compared. I’ve placed this order with AncestryDNA. At the same time I decided to order an autosomal test for dad too, though I have yet to tell him. I only hope all the spitting and swabbing does not cause him to regret his decision to say “yes”! 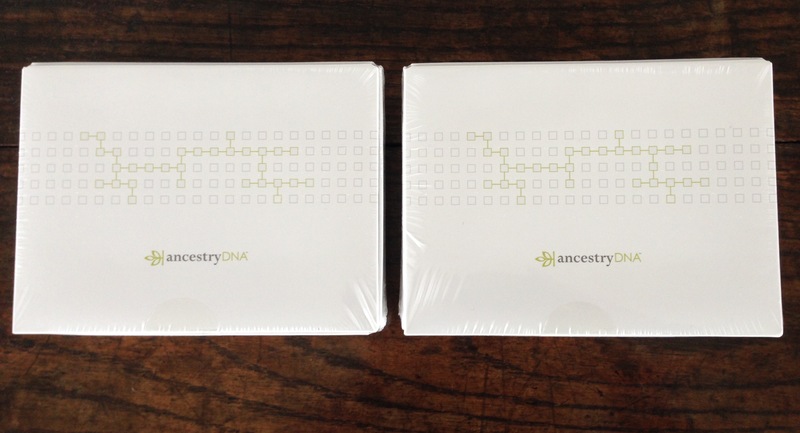 Amazingly, as I’ve been writing this post the Ancestry testing kits have arrived. Astonishingly quick delivery time as it is only 23 June. Now to pass these on to my parents – and let the fun begin!